We are one of the well known suppliers of high quality Banana which are in high demands in the Indian as well as in the international markets. We supply nutritious range of bananas that can either be eaten raw or can also be consumed with milk that makes it a complete diet. 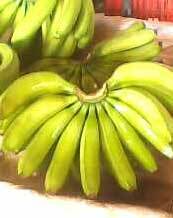 Our bananas can be eaten as a snack food in dried form and it is also be used for preparing various puddings. WEIGHT PER BOX 13KG NET.